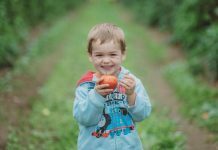 Here is our list (and map) of cafes with kids play spaces on their premises or within sight of where you eat. 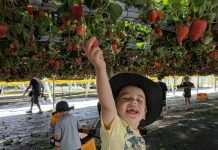 Great if you have young kids and like coffee and eating out. 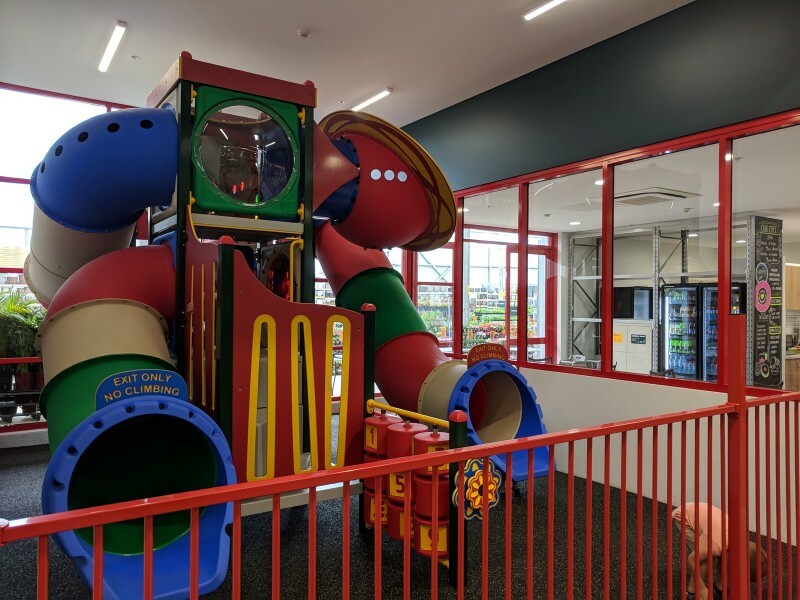 It’s the last piece in the puzzle for parents looking for the winning combo of caffeine, food and something to keep young kids entertained all at the same time! 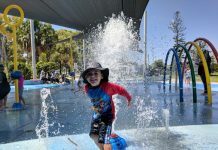 And joins our lists of clubs and hotels with play areas, outdoor fenced playgrounds with cafes a short walk away, cafes near open park playgrounds and local shopping centres with free play areas (which all have some sort of food option nearby). 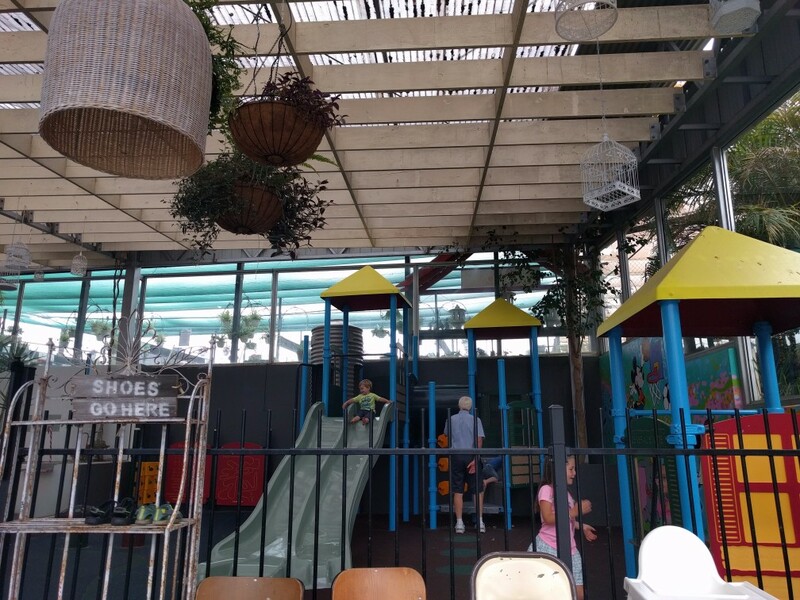 This list of cafes and restaurants with kids play spaces has been a long time in the making – like three years! And is actually longer than I thought it would be – though some have closed recently. 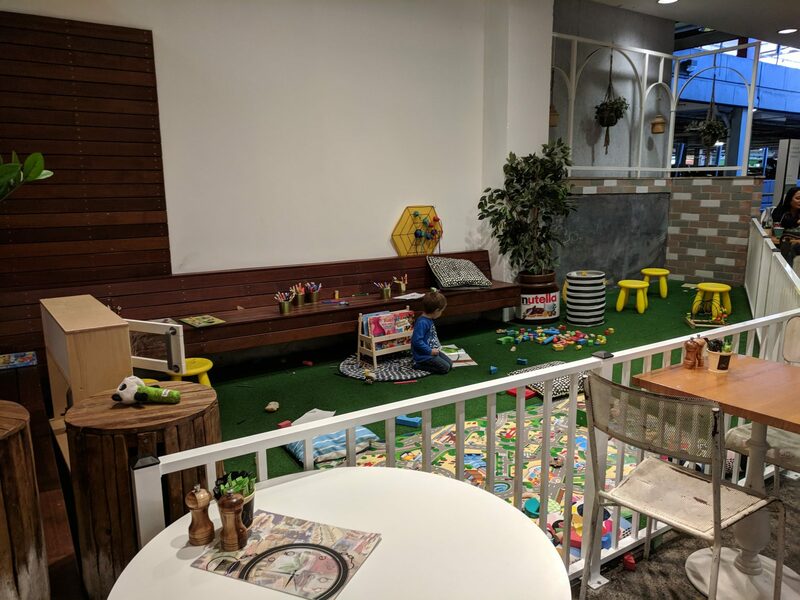 But cafes with an area for young kids to ‘play’ in at the actual cafe are definitely rare, particularly within the City of Parramatta. 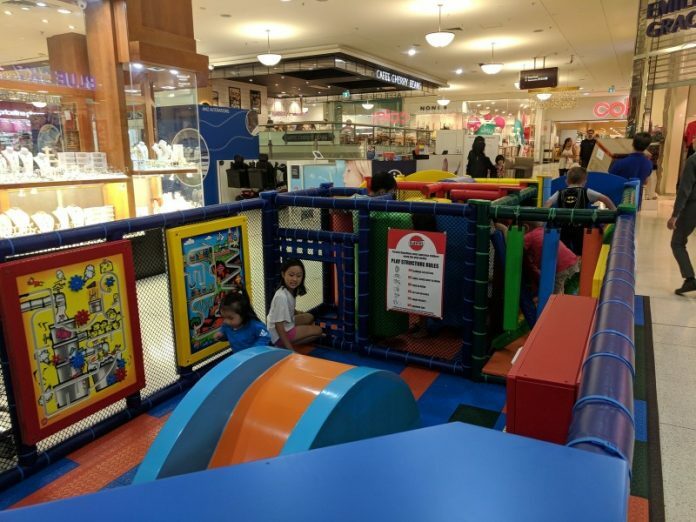 Some cafes and restaurants on this list have a proper playground, with slides and climbing play gym. 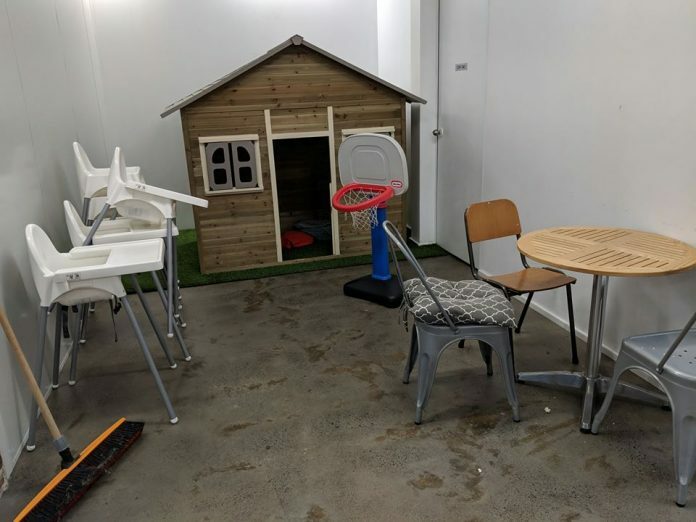 Others have a play space, usually with imaginative type play items. And the last few cafes, have a good selection of kids books and toys. Most are stand alone cafes and restaurants, open for breakfast, lunch and afternoon tea. But a good number are located at a local shopping centre. I have though only included family-friendly cafes that are nice and where the play area is literally right next to the cafe. 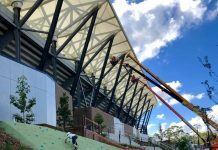 I’ve ordered the cafes within each grouping based on a combination of closeness to Parramatta, setup and location of the play space and our experience of the cafe – service, quality and price…but all are nice places to visit! Up first are 16 cafes that have a ‘proper’ playground with a slide and a play gym. And you’ll be happy to know that nine are fenced! We’ve spent many a morning here having play dates over banana bread, cheese toasties, babycinos and cuppas. The fenced playground is outside but covered. And there are tables on the other side of the fence. You order at the counter inside and then the food is brought to you. The food is very reasonably priced and there is a good kids menu. And it is a very relaxed setting. 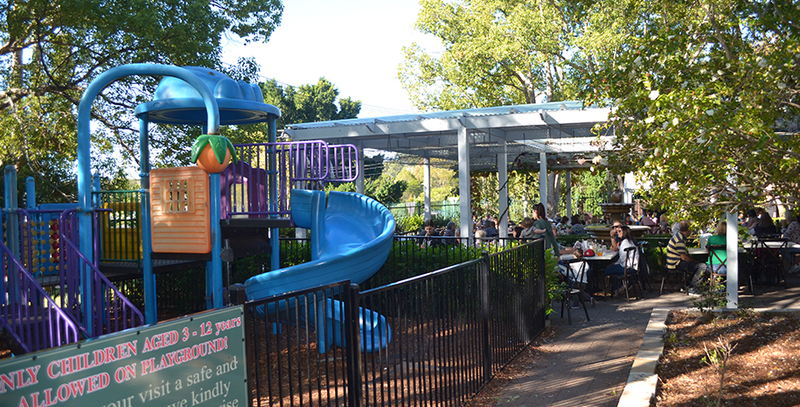 While the kids play in the magical little fenced playground, you can enjoy a coffee or meal at either Little Rock Cafe or Charlie Lovett. Both have seating right next to the playground. The outside tables at Chow Bella Cafe look straight into the fenced outdoor playground at Lidcombe Shopping Centre. 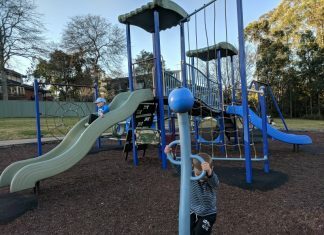 The playground is great for wannabee little ninja warriors with lots of low level climbing. 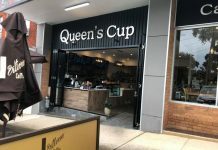 This is our go to spot when I need to shop with the kids on a nice day – delicious food, friendly service, great mix of shops and free parking. 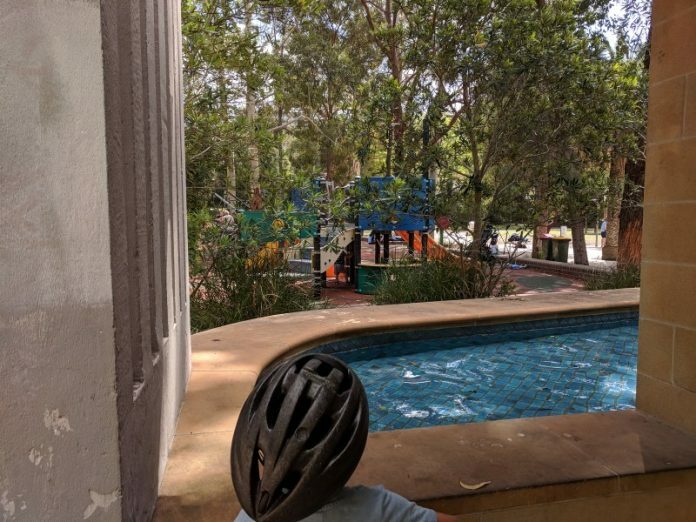 This is a great playground for little ones and I love that you can sit at the tables outside The Local Trade and see right into the playground. Just wish there was a remote control for the gate sometimes. 🤣 I really get to eat in peace here, though my kids are usually to busy playing to be interested in eating! This cafe serves up delicious food and very friendly service. There are a few seats along the balcony walk way that can see down into the fenced playground. 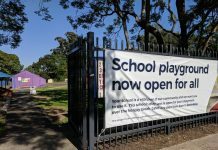 It is only a small fenced playground with some natural shade at certain times of the day. But there is also a lovely library on the other side of the square. This fun cafe serves up a whole lot of yummy food, though more on the expensive side. 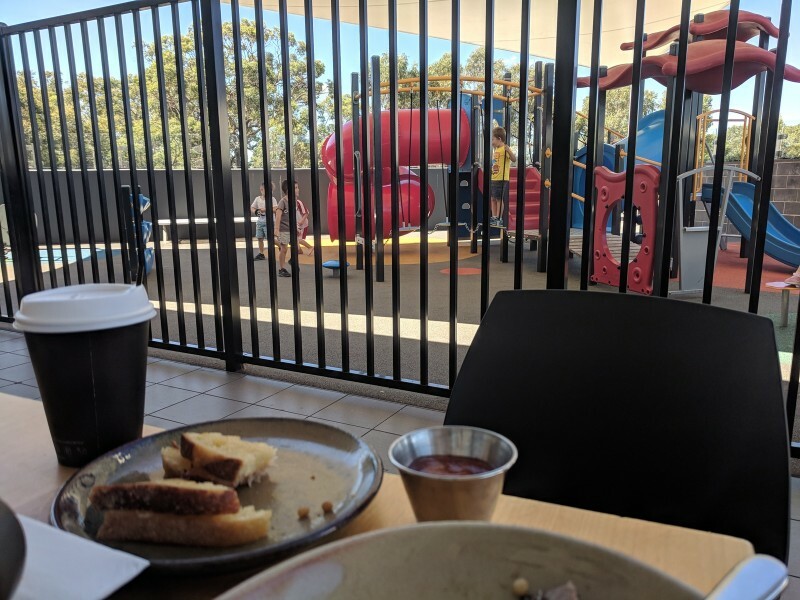 The fenced playground is inside, down the back and there are tables around two sides with views in. This is our favourite local Thai restaurant! We love the combo of delicious Thai food, friendly service and a playground just out the front at John Carver Reserve. 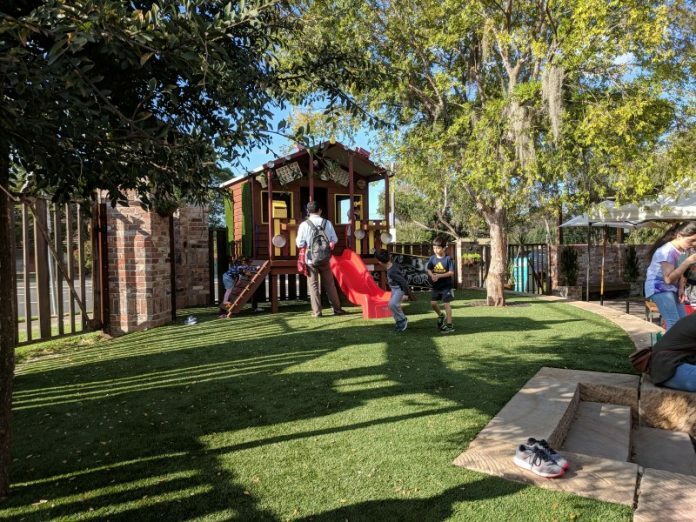 On warm evenings, you can sit outside with views straight to the playground. And most tables inside also have a view out to the playground. Open: Monday to Friday, 11am to 3pm and 5pm to 9:30pm; Saturday 5pm to 9:30pm; closed Sunday. Rashay’s at Top Ryde opened a brand new Little Rascals play area in March 2019. 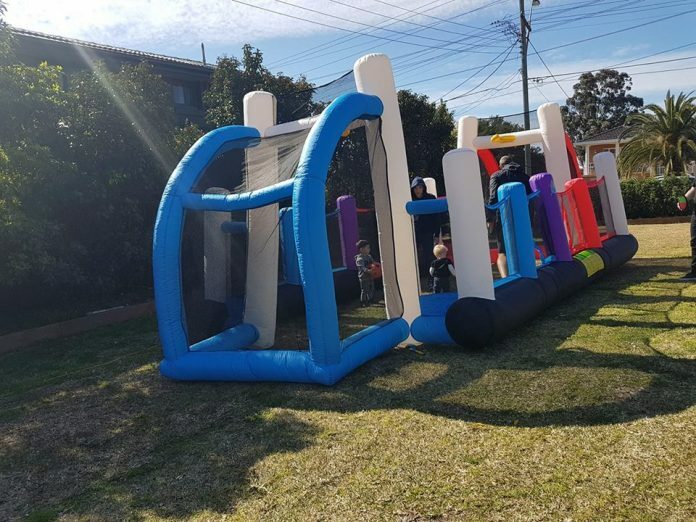 So now you can enjoy your lunch or dinner while your little ones play. 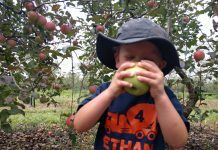 We still haven’t made it here yet…though keep planning to each time we visit Fagan Park and go fruit picking up near Wiseman Ferry. But have heard great things. It has a fenced outdoor playground with some natural shade. 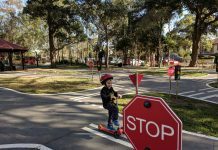 We love visiting this cafe and then our street library, riding on the track, building teepees and playing in the playground. 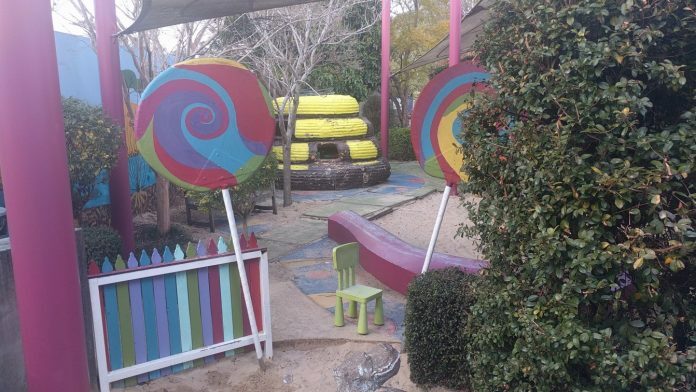 You can see across to the playground from the cafe, but it is across a little lane way. 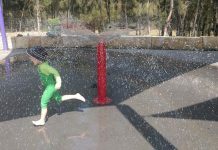 I’m still not comfortable letting my kids go across to the playground, but have seen families with primary school aged kids doing it. But you can get your order brought over to the playground! 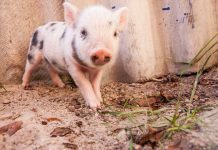 And they have picnic blankets to borrow as well – yay! Open: Tuesday to Friday, 7am to 3pm; Saturday and Sunday, 8am to 3pm; closed Monday. This is NO ORDINARY bakery! Aside from the fun outdoor playground with cubby house and slide, there is a model train that goes around the bakery inside every 30mins. And this bakery is just gorgeous – and so is the food! We always stop by for some croissants on our way back from Canoelands Orchard. While not a cafe I head to for the food, it is great for the convenience of getting a drink, snack and little breather while the kids play next door in the fenced playground. 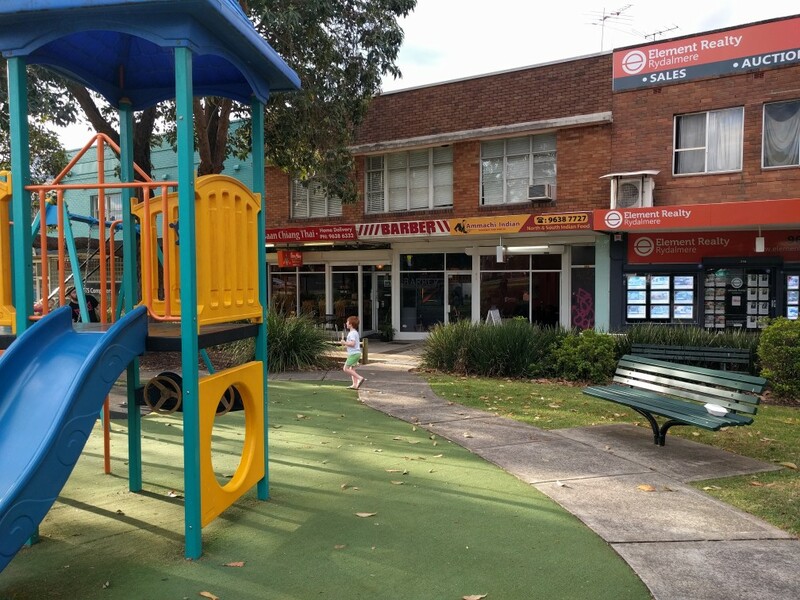 You can see the small playground at North Rocks Shopping Centre from a few of the top tables outside Pronto Rocks Cafe. Though it was only until my little ones were over 4yrs that I felt comfortable staying at the table to finish my lunch while they went off to play. 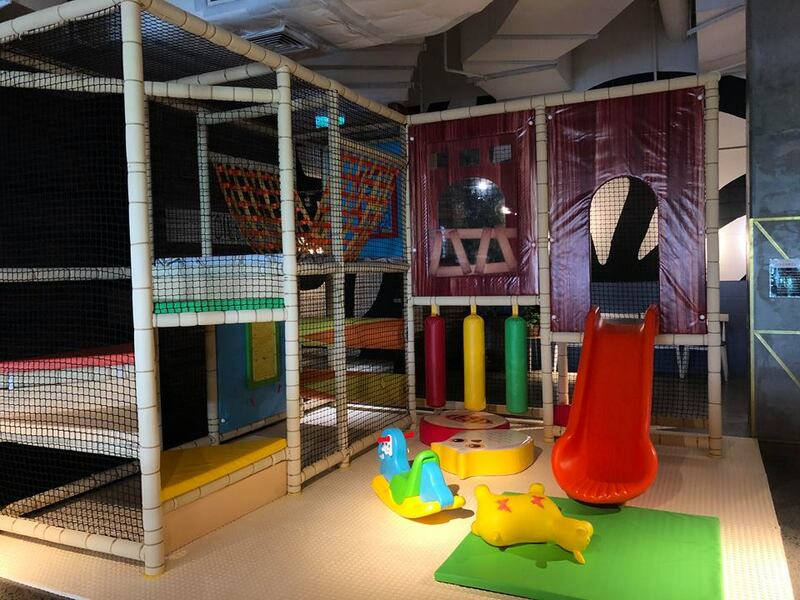 There is a small slide, foam climbing tunnel play gym and vertical interactive boards. Open: Daily from 8am. 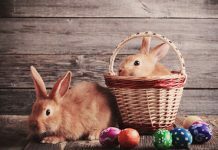 Closes at 4:30pm Monday, Tuesday, Wednesday and Friday; 9pm Thursday; 5pm Saturday and 4pm Sunday. 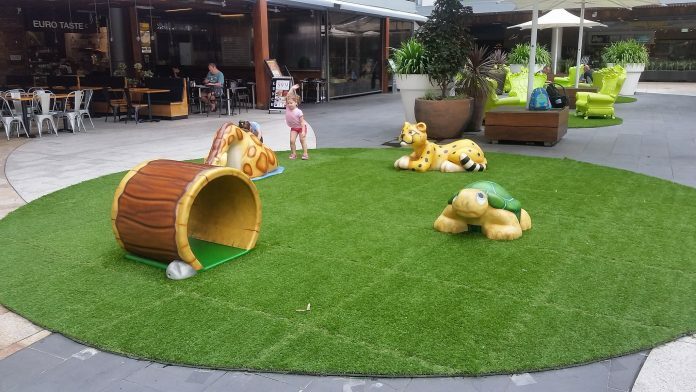 In front of the 3-pod playground at Top Ryde City shopping centre, and with lots of natural light behind it, is Leaf Cafe & Co. 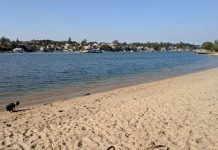 It would be a bit tricky to enjoy your lunch here while the kids played on a busy day, but it is possible particularly with preschoolers. The cafe at Eden Gardens is very large with lots of outdoor and indoors seating. But there isn’t anywhere to sit unfortunately with a view into the outdoor fenced playground below. 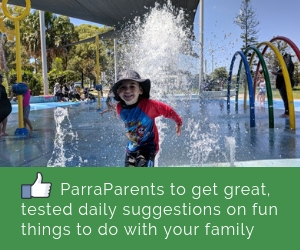 My boys are happy though wondering around the gardens near the outdoor seating and then we head down to the playground. 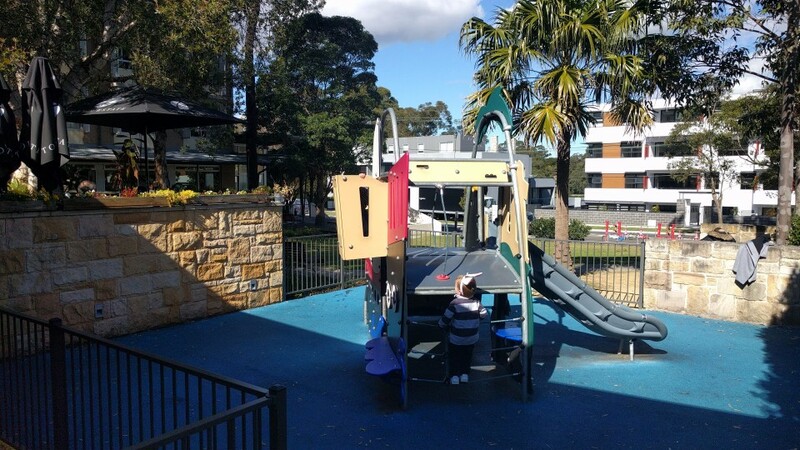 The Grounds Keeper Cafe is right next to the playground at Ryde Park, over the water feature. It’s not fenced and I’m only now feel comfortable letting my 5 and 4yr olds play there while I finish off lunch. 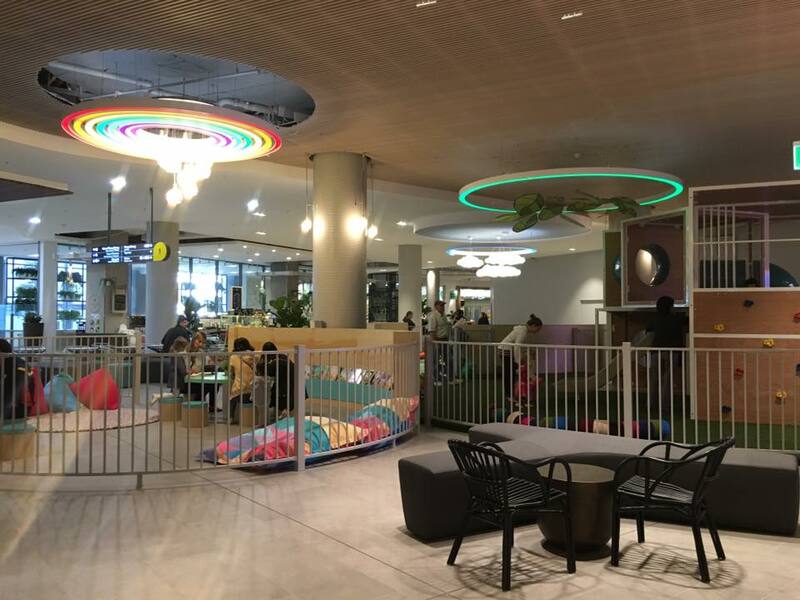 These cafes and restaurants have an area for kids to play, usually with imaginative play items. 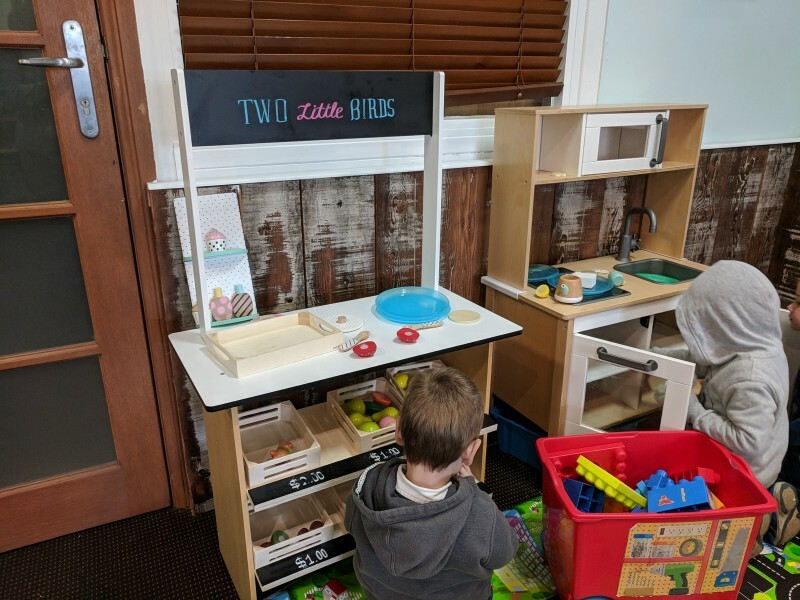 In front of the counter of Two Birds Cafe, at Flower Power Prospect, is a room with dining tables and a kids play space. There is a kids table for colouring in, pretend kitchen, bean bags and other toys. 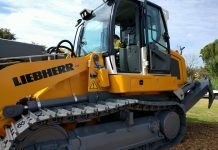 We enjoy visiting the garden and then having lunch and a play here. 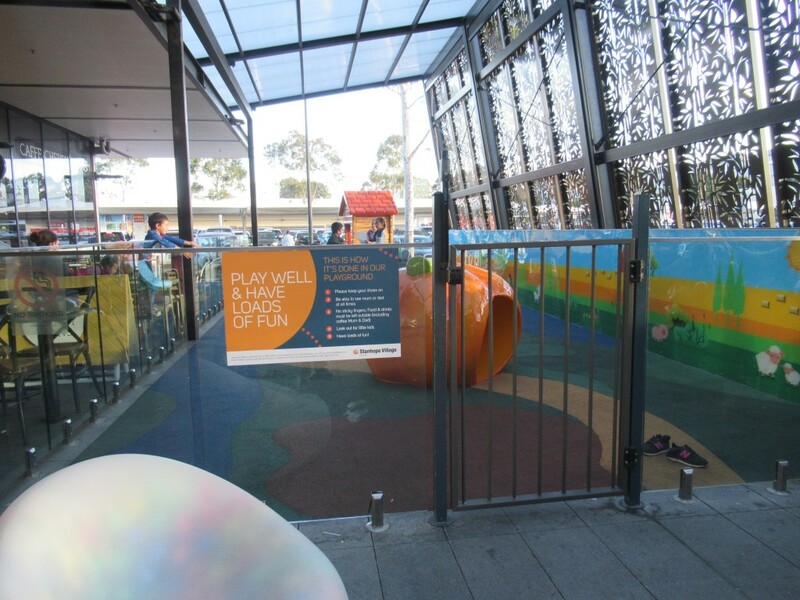 Tucked in near a carpark entrance at Macquarie Centre, is this fenced play space for kids at the yummy Vogue Cafe. 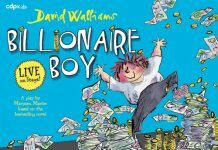 There are books, pretend kitchen, colouring in, chalk board and other toys. Sadly it wasn’t well looked after by families using it last time we went and staff only reset it at the end of each day. 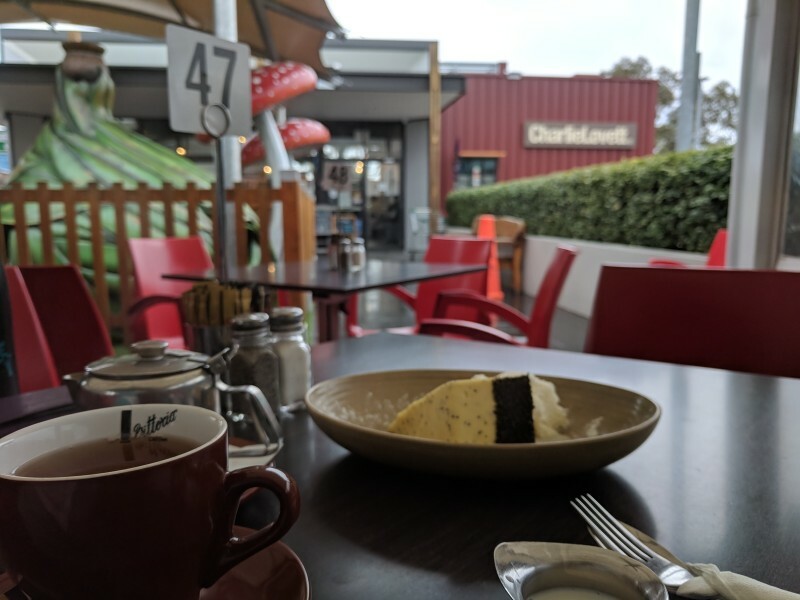 One of the ParraParents team enjoyed brunch at Atlas Cafe recently. They initially thought the kids play space had a jumping castle but its actually a ball play area. 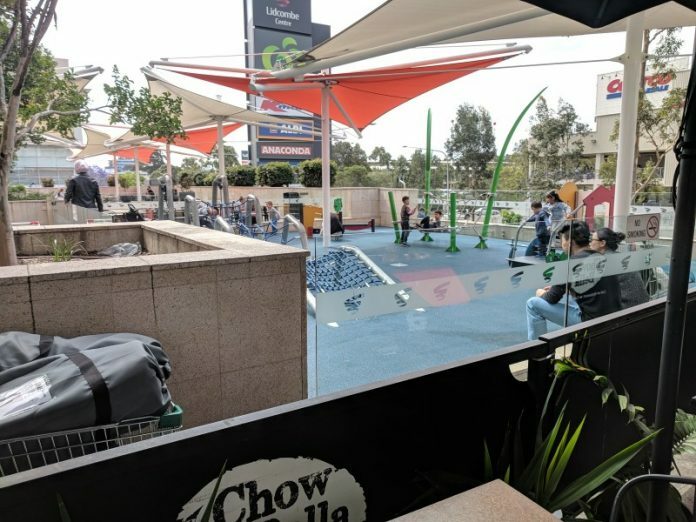 The outdoor dining area at Top Ryde City shopping centre, known as the Piazza, has a kids play space in between the library and the water fountains (which the kids will also love running through on a warm day!). Sometimes there are mega games, like connect 4, added. And in the evenings, usually Friday nights, there is entertainment for families. 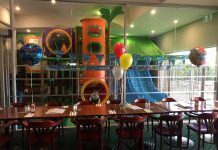 The restaurants which have the best view of the play area are Coco Cubano, Schnitz, Euro Taste Cafe. And Coco Cubano has a kids eat free deal – one free kids main per $20 food spend all day, every day. My farm obsessed kids love the farm themed outdoor fenced play area at Stanhope Village shopping centre. And right on the other side of the clear fence are two cafes – Michel’s Patisserie and 18 Grams (new). 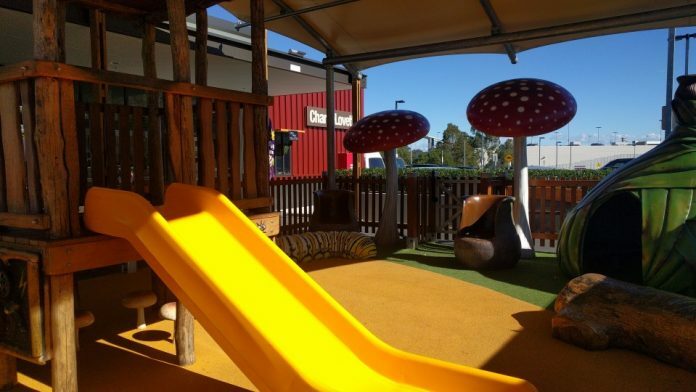 Kinder Cafe is a cafe and kids activity centre in one. 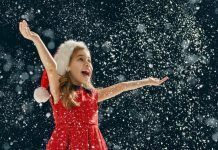 While you sit and enjoy a lovely coffee in peace, your little ones can enjoy yoga, craft and dance classes. 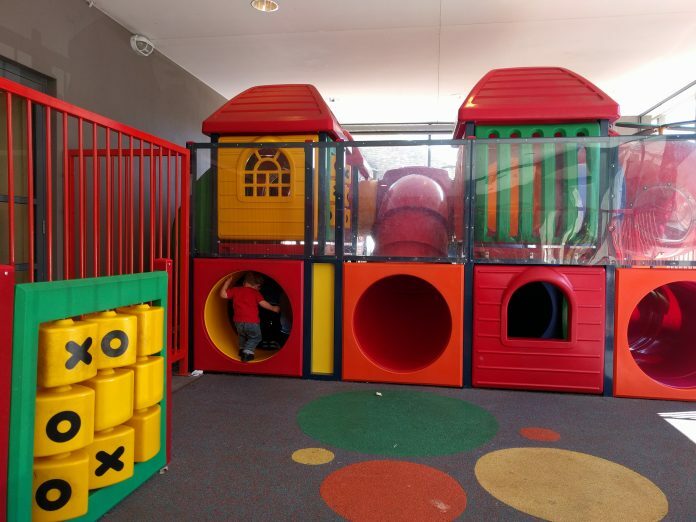 Or just play in the cubby house. Open: Monday to Saturday, 8am to 3:30/5pm. Closed Sunday. The kids play space at Lil Miss Collins is really only for toddlers, with a tiny slide and rocker. 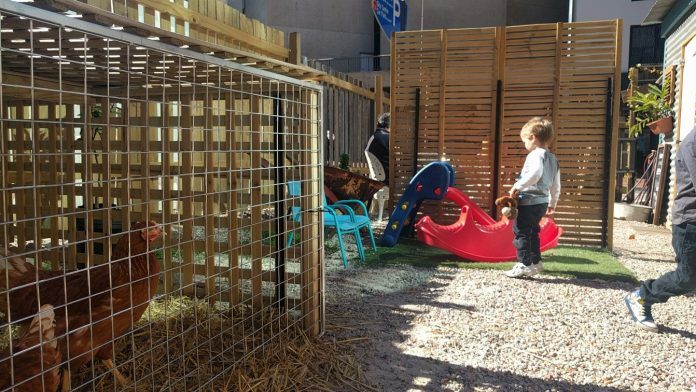 Sadly there aren’t any chickens anymore, but Jubilee Park and Parramatta Library are a short walk away. We also like the outdoor dining and yummy food. 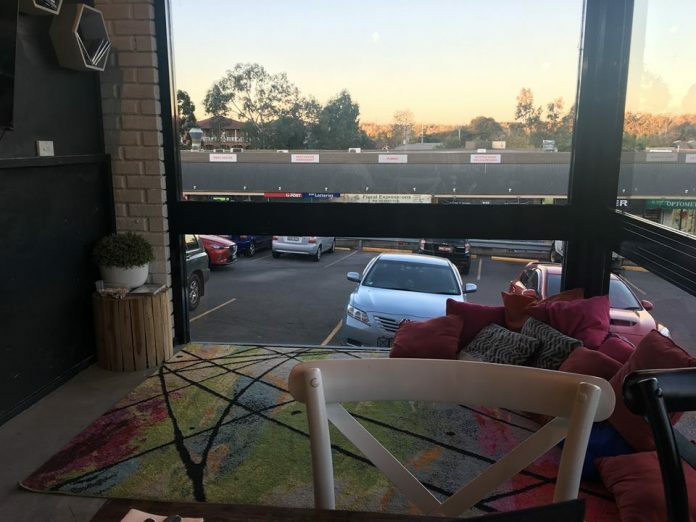 The main feature of the kids area at Enzos Italian Restaurant in Northmead is the tv and cushions – nice spot for kids to relax. There are also some books and colouring in. And they have a view out to the carpark. 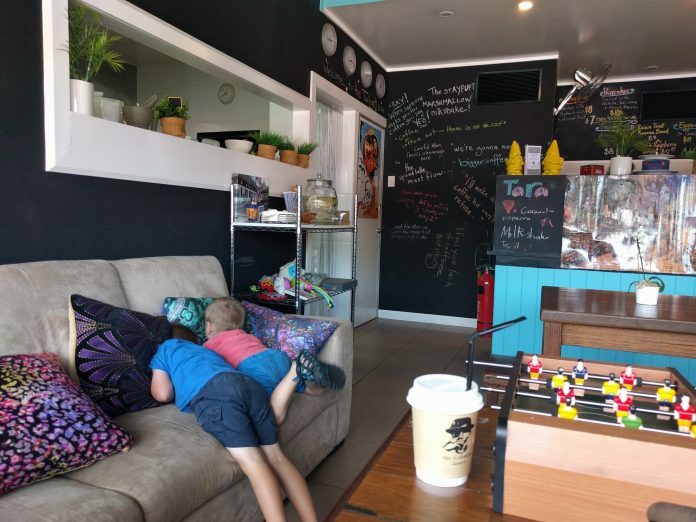 These last few cafes may not have a separate area for kids but they do still make them feel welcome with kids books and toys. Linda, the owner of Caleidoscope Cafe, is a former teacher and is great with kids. There is a bookshelf in front of the kitchen with books and toys, plus a lounge for the kids to sit on. 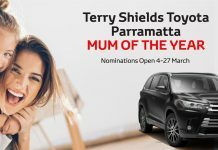 If you ask, Linda can also get out a car mat for the kids to play on. 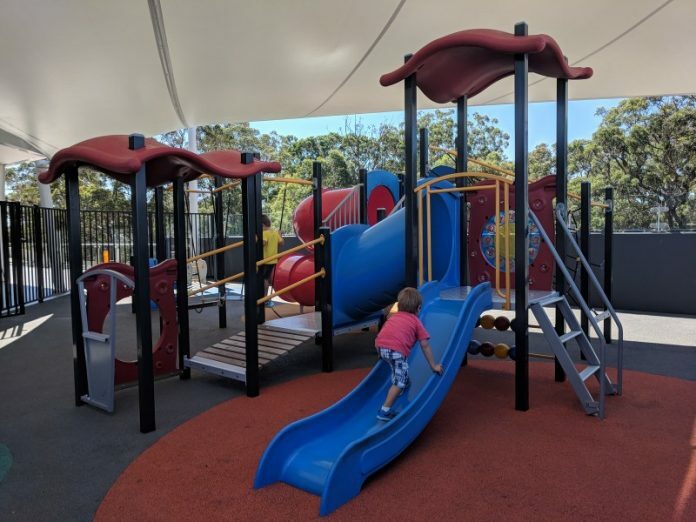 And around the corner is the playground at John Carver Reserve. 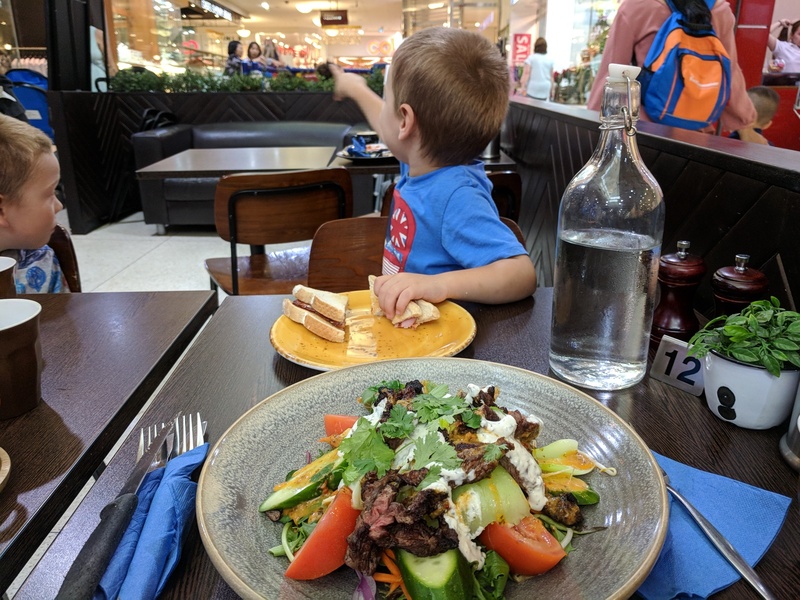 The Shed Cafe, at the bottom of the V by Crown building, offers families somewhere to eat out in Parramatta CBD that is little kid friendly. 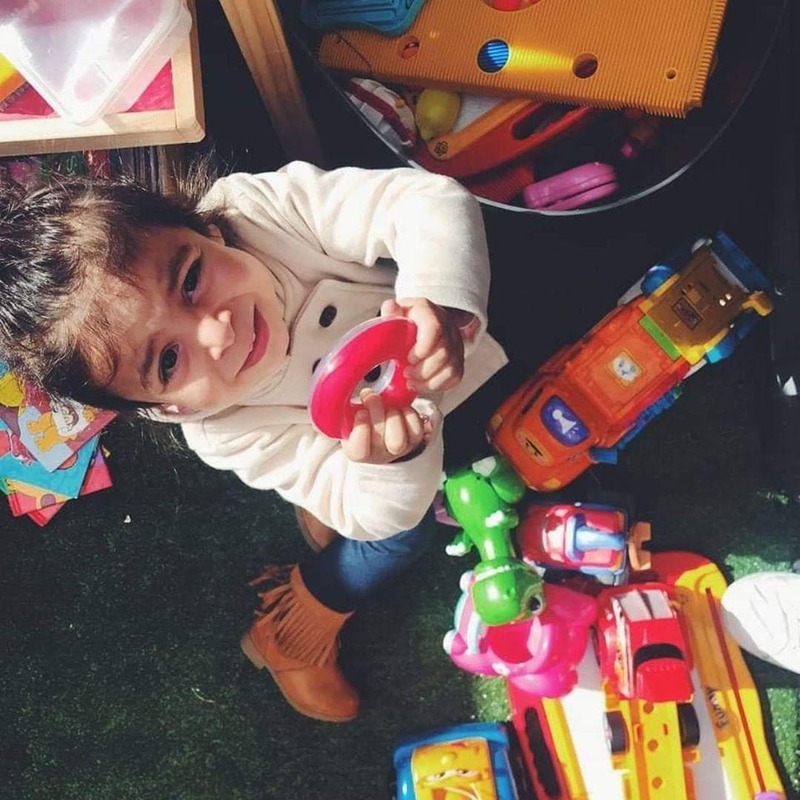 They have a few buckets of toys and books for the little ones to play with. Here is a map of the cafes with kids play spaces, grouped by what kids have to play with.